Enjoy a flight from Las Vegas to Page, Arizona with a guided tour through Antelope Canyon's sandstone formations and visit the famous Horseshoe Bend. This one-of-a-kind unique experience includes round trip hotel transfers from your Las Vegas hotel. Tour time is approximately 11-12 hours. Visitors to Las Vegas can now enjoy a flight directly to Page, Arizona, complete with a tour of mystical Antelope Canyon and the spectacular sandstone formations at Horseshoe Bend. Guests will have the opportunity to fly above beautiful Lake Powell and stunning Glen Canyon. Upon landing, each passenger will be given a box lunch to enjoy in our terminal gate. The gate features a floor-to-ceiling glass window where guests can see the nearby Tower Butte and the exotic desert landscape. After fueling up with lunch, passengers will be transferred to the entrance of Antelope Canyon and begin a guided tour of this world-renowned slot canyon. 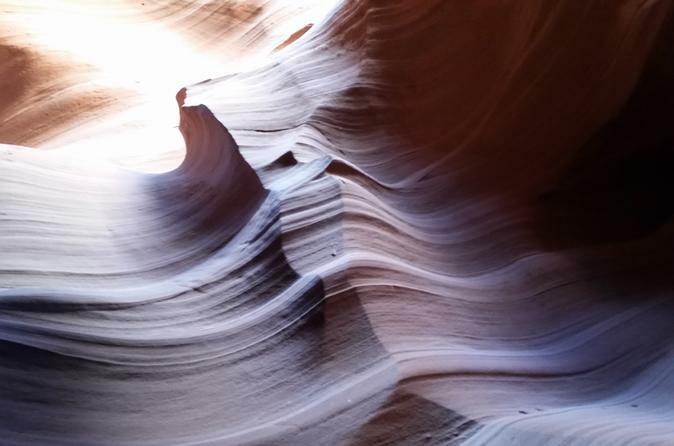 Guests can photograph the famous ancient sandstone rock formations and the sunlight dancing into the canyon. The tour continues with a view of Horseshoe Bend, where visitors will be able to look over the edge of this uniquely twisted cliff to see the incredible Colorado River below. Please note: Children under the age of 6 are not permitted on this tour. Also, due to some steep terrain and a portion of Antelope Canyon that requires guests to climb stairs, this tour is not wheelchair-accessible. Sturdy shoes are highly recommended. © 2019 Hello LasVegas - All Rights Reserved.